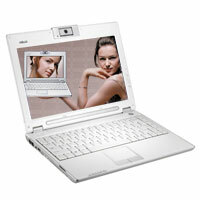 ASUS W5F features Intel Core Duo Processor T2000 (1.6-GHz to 2.16-GHz), 12.1-inch WXGA LCD display with Color-Shine technology, 512MB of DDR2 memory, 5400rpm 60-120GB hard drive, 180 degree swivel 1.3 MP camera, and embedded Intel 945GM VGA graphics. ASUS W5F laptop weighs 3.5-pounds and also comes with external interfaces include a 4-in-1 memory card reader, three USB 2.0 ports, FireWire port, Bluetooth V2.0+EDR (optional), and 802.11 a/b/g Wi-Fi. TrustedReviews reviewed Asus W5F and gave a rating of 8 out of 10 for Asus W5F. In the comparison to Sony SZ1VP, conclusion was that if you can afford the Sony SZ1VP, it’s the better machine, but there’s a significant price difference. If you’re looking for a more affordable small and light notebook to take with you on your travels, then the Asus is a good bet. It will fit in your bag, it’s got a good enough display, and decent battery life and some nice touches such as the webcam and wireless switch buttons. It also looks good and is great to type on and thanks to the Core Duo it always feels snappy and responsive. With the street price likely to be less than the quoted price, this could be a notebook that hits the spot for both work and entertainment on the move. Overall, TrustedReviews concluded that for Asus W5F notebook, with a 2GHz Core Duo processor under the hood this is an ultra portable machine that isn’t ‘just for girls’ despite the ice white looks. A good choice if you’re budget can’t stretch to a Sony SZ1VP, though be sure to upgrade the RAM to 1GB.